Trayveon Williams ran through the back of the Auburn end zone after a 38-yard touchdown run, got to the first row and shook hands with a seated fan. 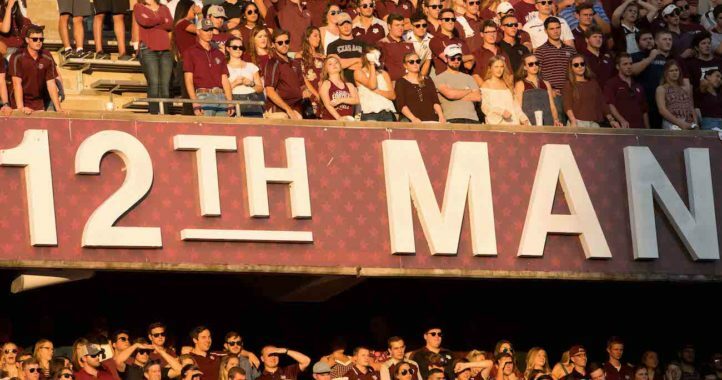 I’m not sure if it was an A&M fan, but one thing was clear. 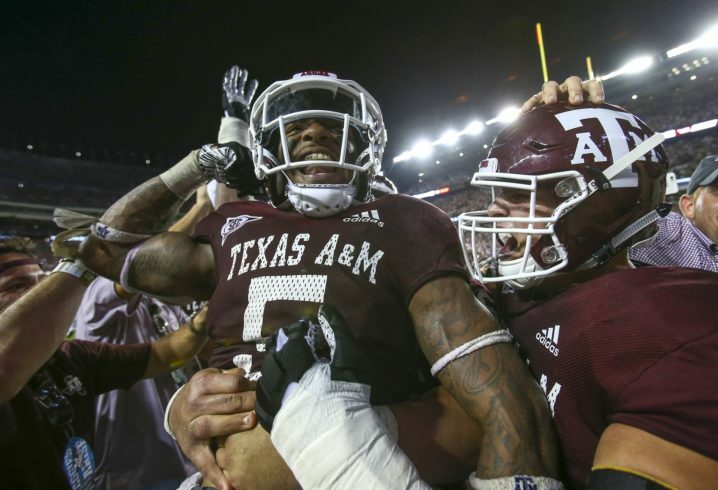 When the Texas A&M tailback is feeling it, he’s one of the top backs in the country. Fortunately for the Aggies, he’s been feeling it a lot this year. He can take over a game in an instant, and he can do so in a variety of ways. Twice this season, Williams had games in which he ran for 100-plus yards while catching 5-plus balls for at least 70 yards. The latest of those games was last Saturday at Auburn, where it looked like Williams’ brilliance was going to lead the Aggies to a victory. That is, until they squandered a 10-point lead in the final 5 minutes. Miscues down the stretch spoiled what was easily one of the top performances we’ve seen from any SEC running back this season. That’s becoming a more common theme for Williams in Year 1 in Jimbo Fisher’s offense. If we’re voting today, Williams is a first-team All-SEC back, and I’m not really sure that’s much of a debate. For all the talk about the development of Kellen Mond with Fisher, it’s clear that Williams has been the engine that starts the offense this year. Before Saturday’s prolific effort, Williams averaged 29.3 yards in A&M losses and 147.2 yards in A&M wins. Granted, the 3 losses were against elite defenses in Alabama, Clemson and Mississippi State. Going off and still losing to Auburn was the outlier. Usually when Williams is rolling like that, the Aggies are in good shape. Maybe it’s the fact that Williams is finally getting to play with a fullback, which had him giddy this offseason. Williams, as he did on his 38-yard scamper and handshake celebration run, was untouched thanks to having a lead blocker to follow out of the backfield. That was the other aforementioned game in which Williams racked up 100-plus rushing yards while catching at least 5 passes for 70-plus yards. His counterpart that night, Benny Snell Jr., is the only SEC running back with more rushing yards than Williams’ 931, which is already 133 yards better than his 2017 total on 7 fewer carries. Snell might be the other obvious choice to earn first-team All-SEC honors, but as great as he has been, he doesn’t have Williams’ versatility. Williams leads all SEC backs in catches (22) and yards (257). He’s actually on pace to finish with the most receiving yards for an SEC running back since Alvin Kamara finished with 392 in 2016. It’s interesting that when Williams had his career day to hand Kentucky its first loss, he said after the game that he showed why he’s one of the best backs in the SEC, “if not the best.” Perhaps that was throwing a little shade at Snell, who was outgained 210-78 that night (Williams actually outgained the entire Kentucky offense), but really, was Williams wrong? In a year in which the likes of household names like D’Andre Swift and Damien Harris have disappointed from a cumulative production standpoint, it’s becoming clearer and clearer that Williams’ body of work needs to be recognized. If Williams can finish strong and earn first-team all-conference honors, he’ll make a little history. Since joining the SEC in 2012, the Aggies have yet to have a running back even earn second-team All-SEC honors. Barring an injury or an epic collapse, I’d say Williams should at least have that in hand. While Williams would probably trade wins over Clemson and Auburn for individual accolades, he’s certainly going to be worthy of praise. Looking back, it seems obvious why he was so excited to play in a new, running back-friendly offense. As long as he’s in College Station, Williams will inevitably keep following a fullback-paved path to pay dirt. And maybe instead of just a touchdown and a handshake, he’ll pick up some hardware along the way. Now that’s a well phrased retort. You have skills. Kirby isn’t exactly known for his literary skills. 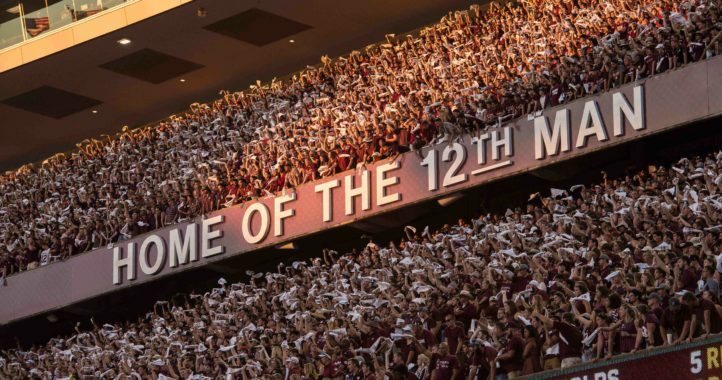 TAMU is known for collapsing every November, sure didn’t disappoint this year! Not sure what that has to do with Kirby’s poor literary skills, but if being irrelevant is your gig, you do you big guy. No, as in Holyfield’s YPC is 0.93, AKA about a full yard, more than Williams’. Swift’s is 0.67 more. Holyfield has 72% of Williams’ yardage with 38% less carries. Swift has 67% of Williams’ yardage with 40% less carries. Scottie Phillips averages 0.71 more YPC than Williams, and has 99% of Williams’ yardage with 12% less carries, and has 12 TDs to Williams’ 10. Ke’Shawn Vaughn averages 1.2 more YPC than Williams, and has 72% of Williams’ yardage with 41% less carries. Najee Harris averages 1.2 more YPC than Williams, and has 61% of Williams’ yardage with 49% less carries. Damien Harris averages 0.62 more YPC than Williams, and has 58% of Williams’ yardage with 48% less carries. Rakeem Boyd averages 0.93 more YPC than Williams, and has 66% of Williams’ yardage with 43% less carries. You must be looking at old stats. I don’t have time to go into every comparison, but just for starters Phillips as of today has 6.32ypc with 146 carries while Williams is sitting at 6.77ypc with 156 carries. That’s also only 3% fewer carries, although that argument makes no sense since it really doesn’t effect the YPC stat one way or the other. Now I see you were talking fewer carries in comparing total yards. That is still a moot point as it’s already accounted for with the YPC. YPC is one the most important stats for any running back. Nobody cares if you reach 100 YPG (which Williams doesn’t necessarily do as consistently as say, Chubb in 2014-15) if you take 25-30 carries to do it. And those stats are up to date, coming straight from the SEC’s official website. I tried pasting the link but it said “comment awaiting moderation”. Trayveon Williams has 166 carries for 931 yards, which averages out to 5.61 YPC. I never argued the importance of YPC, I agree completely. It’s not however the only stat that matters. You aren’t taking into account the other skills Williams brings to the table such as blitz pickups and catching. When you take the entire package into consideration it’s really hard to argue Williams isn’t a first team all sec RB. If we’re talking about complete packaging I would say Swift could be considered for it as well, according to your reasoning. He’s one of the best pass-blocking RBs in the country and has shown definitive pass-catching skills. When you start bringing those factors into account you begin edging into the “eye-test” game, which never really works out. Of course Swift should get consideration. This was never about Williams being the clear #1, it was about him having a solid argument to make first team SEC. I felt the article was saying that if they were voting on it today, Williams would be the clear choice, and currently I disagree, as I think there are maybe 4-5 backs in the SEC (no, I don’t put Benny among them) who have just as strong if not a stronger argument than Williams. However, he’s gotten past the tough D-lines of Alabama, Auburn, and MSU, so his argument should only get stronger from here. Maybe I misread it. I took it as him having a strong argument for first team, not necessarily the only strong argument. At this point I don’t see anyone really creating distance from all the other backs to be a shoe-in. The kid did nothing against a real Defense a couple weeks ago. The video appears A&M wanted to score. BUT does this young man have banners hanging in New York City? So there! It took A&M two plays to go 25 yards in the overtime. Kentucky football has banners of Snell, Allen and others hanging in downtown New York City. Kentucky’s all American corner?, was taken out of the play by one blocker. We gave up when we didn’t score they flat, laid down. Not sure what any of this has to do with banners of Snell in downtown NY. 26 yards on 10 carries against Miss St – Definitely negative. You make it sound as if he controls how many carries he gets. That’s not the point. The point is that he averaged 2.6 YPC on those attempts. Most runners average starts low and builds as the game goes on and the defensive front wears down. If they had stuck to the running game the average would have been higher. Certainly not as high as the season average, but that’s more of a credit to States run defense than Williams skill. They don’t start that low, though. Yes, MSU has a solid run defense, but a 1st team SEC back would definitely be surpassing 2.6 YPC after 10 carries. Boyd averaged 2.0 against Eastern Illinois. Phillips managed 3.4 against Auburn in 17 carries, his first 10 were certainly nowhere near 3.4. Vaughn only managed 4.1 against Middle Tennessee and 3.3 against South Carolina. Hardly impressive outings, but one game doesn’t really embody their season. One game doesn’t embody Williams season either. Of course, but there is a reason that those RBs play for some of the worst teams in the SEC. I assume you’re mostly referring to their O-lines? If so it’s actually a good point in William’s favor as well. Aggie O-line is not exactly NFL material in the making. It’s a point Fisher is looking to shore with this recruiting cycle. Good point, I never thought about that. Then again, Swift and Holyfield are playing behind a line comprised, from LT-RT, a sophomore, a true freshman filling in for an injured redshirt sophomore, a senior who was temporarily replaced by a true freshman when the former was injured, a redshirt sophomore, and a redshirt freshman. True, but I don’t see both Holyfield and Swift getting first team. Receiving yards is where both Williams and Swift pass Holyfield up in my opinion. I haven’t seen enough of Holyfield and Swift to speak on their block abilities either, but I do know Williams absolutely excels in this area. It wouldn’t surprise me to see all three somewhere on 1st and 2nd teams. 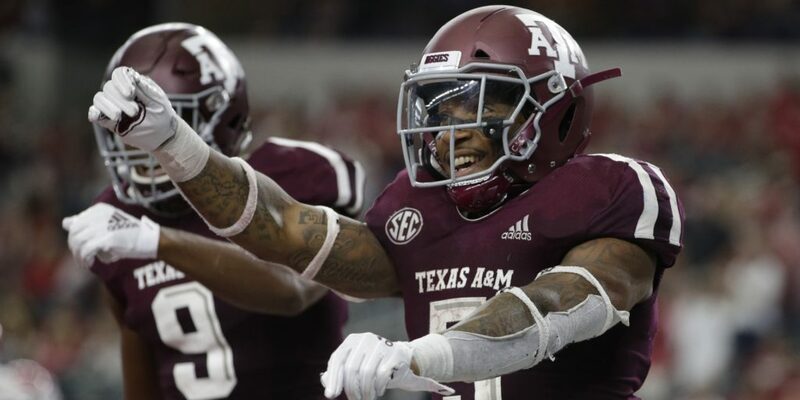 A&M got keel hauled in 3 of the 4 losses primarily because of abysmal DB play, particularly the CB’s. It’s interesting that Sternberger usually starts clicking when Tray is clicking. Tray benefits greatly from a run heavy offensive scheme. The OL is not yet dominant but it’s trending in that direction. With nobody using a FB anymore it’s not easy for op defenses to get ready for it. It’s obvious the big hitters and the KY crew want their RB’s #1. 3 games left for Tray to shine. We will see. I read a compassion to Snell in the article. Again, what do banners in NY have to do with anything represented here?